All that talk about methane in cow farts may actually be onto something. 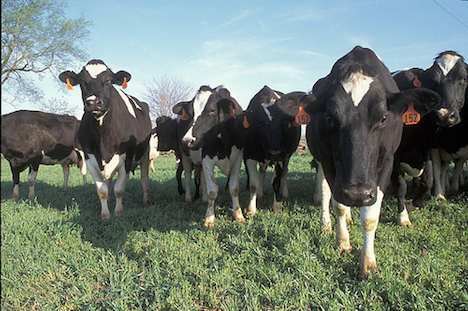 According to a case study in Vermont, it may be viable for dairy farms to convert cow manure into electricity using anaerobic methane digestion. With the right levels of commitment from farmers, customers, utilities and government agencies, using cow poop as electricity may be more realistic than it sounds. Over seven years, six dairy farms took part in the Central Vermont Public Service Corporation’s Cow Power Program to determine how much electricity, if any, could be developed. According to the Journal of Dairy Science, they generated about 12 million kilowatt-hours of electricity each year, and over 4,600 customers voluntarily paid $0.04 more per kilowatt-hour to use that power. University of Vermont professor Qingbin Wang says, “The Cow Power Program represents a successful and locally sourced renewable energy project with many economic and environmental benefits.” However, the program’s success is still riding on several factors such as the base price of electricity, financial support of government, and additional revenue from byproduct sales. Politics aside, it is fascinating to see that electricity can literally be generated from cow poop. Would you like to see more dairy farms generating electricity from cows?